Innovation is in the core of the survival of the fittest organization in today’s technology-driven global economy. Innovation process begins with identification of the market needs or technology opportunity and then goes through stages such as adopting or adapting existing technology that satisfies the identified need or opportunity, inventing when needed, and finally transferring this technology by commercialization or other instrumental means. 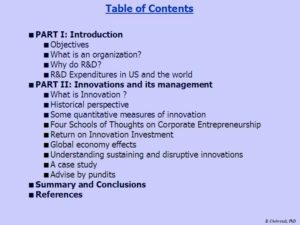 Considering the key role R&D plays in the economic health of a nation and the world as a whole, the profitability of a business, the effectiveness of a technology-based governmental agencies, and the enormous investment nations make in R&D activities, effective and efficient R&D management to bring about innovations can have profound and determining consequences. 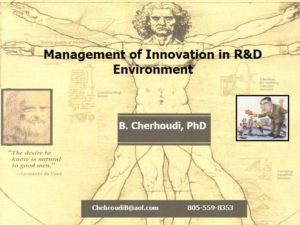 In this seminar issues related to an innovation-driven economy and its management are discussed in the context of research and development. Seminar was first presented at the Powertrain International Senior Management meeting (Page 10). Organizations or individuals interested in this seminar should contact Advanced Technology Consultants directly. Due to ATC's low overhead, direct-contact clients are offered a competitive and cost-effective package.